The Jazz Bakery is thrilled to have a new home base at the beautiful Moss Theater in Santa Monica. The scale, location and instructive surroundings are a pitch perfect fit for the fabulous artists that we work with. 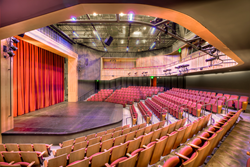 The Jazz Bakery, Southern California’s premiere presenter of America’s great musical art form, and Santa Monica’s New Roads School at the Herb Alpert Educational Village, have formed a partnership that will provide a home base for the Jazz Bakery’s regular concerts in the Ann and Jerry Moss Theater. With a grant from the Herb Alpert Foundation (http://www.herbalpertfoundation.org), this collaboration will also create a variety of new music enrichment experiences for the students at New Roads School. “The Jazz Bakery is thrilled to have a new home base at the beautiful Moss Theater in Santa Monica. The scale, location and instructive surroundings are a pitch perfect fit for the fabulous artists that we work with,” said Jazz Bakery founder and artistic director Ruth Price. The Jazz Bakery was founded in 1992 by Ruth Price, current President and Artistic Director. In 2009, after 17 years of concerts held exclusively in Culver City’s Helms Bakery complex, the Jazz Bakery began hosting performances in a variety of venues around the Southland, including the Moss Theater. The Moss Theater is a 350-seat state-of-the-art venue with acoustics designed by world renowned Yasuhisa Toyota, designer of Walt Disney Concert Hall. Onsite dedicated parking, a spacious lobby and an intimate courtyard are details that enhance concert-goers’ experience. The partners plan to add high quality snack and beverage options for attendees. In addition to hosting ongoing concerts, New Roads School and the Jazz Bakery plan to collaborate on a number of other musical enrichment activities that will be offered to New Roads students and young people throughout Los Angeles, particularly those who may not have access to the arts. The Herb Alpert Foundation has provided funding for both of these organizations and sees this partnership as a means to enrich and expand a spirited and inclusive community that supports the arts. Master classes with visiting artists, a Jazz Speaker series, internships and apprenticeships are among the new activities planned by the partners. The Jazz Bakery is also excited to be hosting the Quincy Jones Urban Jazz Camp, a summer program for aspiring musicians, slated to begin in 2019 with a grant from the Quincy Jones Musiq Consortium. The Herb Alpert Foundation envisions a world where all young people are blessed with opportunities that allow them to reach their potential and lead productive and fulfilling lives. The Foundation has always sought out programs that were creatively conceived and run, and by narrowing our focus to the Los Angeles area, with few exceptions, we have been able to cultivate a sense of community among our grantees. We rely on our philanthropic and nonprofit partners in the field to do our work well and are committed to maintaining that spirit of collaboration in all aspects of our work. Beyond providing grants, we aim to foster connections among our portfolio of grantees by convening select groups, depending on need, to discuss issues they are facing and help find solutions together. To learn more about the Foundation visit http://www.herbalpertfoundation.org.